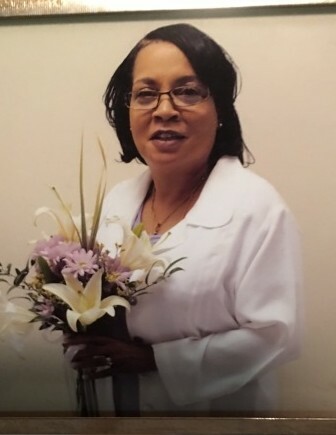 Angela Hunt-Hussey, also known as "Angie B", 58 of 1401 Washington St., Wilson, NC passed away Saturday, October 27, 2018 at her home. Funeral service is scheduled for Saturday, November 3, 2018, 2:00 PM at Stevens Funeral Home, 1820 Martin Luther King, Jr. Pkwy, Wilson, NC. Burial will follow in Rest Haven Cemetery, 1800 Lane Street Ext., Wilson, NC. A public visitation is scheduled for Friday, November 2, 2018, 3:00 to 7:00 PM at Stevens Funeral Home. Preceding Angela in death were: her husband, Willie Hussey; her parents, Freddie Oliver Delaney and Mary Elizabeth Hunt; two step-sons, Victor Hussey and Reggie Barnes and one brother, Michael Eric Hunt. Many precious memories are left to: her son, Carlton Levell Hunt (fiance' Leora) of the home; her stepmother, Mary Frances Delaney of Rocky Mount, NC; two sisters, Patricia Yvette Hunt of Goldsboro and Valarie Joi Carter of Chester, VA; three nieces, Zsajauna Taylor (T.J.) and Kijhanique Hunt, both of Goldsboro, NC, and Rijhanique Brown (Calif) of Clayton; one nephew, Brandon Carter of Chester, VA; a special great niece, Legacy Noelle Brown; four great nephews, Bronton Woodard, Jr., Montreai Woodard, Kjuan Woodard and Javari Samuel, all of Goldsboro, NC; two special cousins, Rodney Dancy of Wilson, who was like a brother to her and Vickie Coleman (Don) of Baltimore, MD, who was like a sister to her; one god child, Erykah Murchison of the home; one uncle, James Delaney (Phyllis) of Baltimore, MD; two aunts, Amanda Atkinson (Roy) and Josephine Carter, both of Wilson, NC; five step-daughters Denise Hussey and Shirlene Hussey, both of Elm City, NC, Sheila Simmons of Rocky Mount, NC Tamekia Pender of Stantonsburg, NC and Sharon Mercer of Wilson, NC; two step-sons, Tyrone Barnes and Milton Barnes, both of Wilson, NC; one brother-in-law, Samuel Hussey (Margie) of Capital Heights, MD; one sister-in-law, Ruby Woodard; and a host of cousins, other relatives and friends.